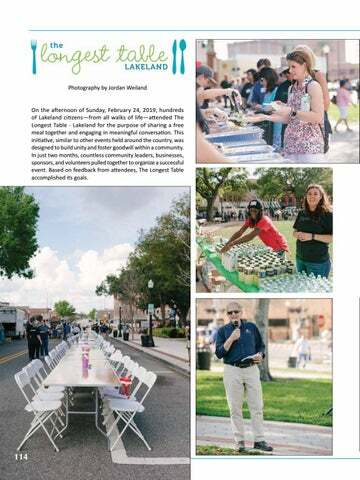 Photography by Jordan Weiland On the afternoon of Sunday, February 24, 2019, hundreds of Lakeland citizensâ&#x20AC;&#x201D;from all walks of lifeâ&#x20AC;&#x201D;attended The Longest Table - Lakeland for the purpose of sharing a free meal together and engaging in meaningful conversation. This initiative, similar to other events held around the country, was designed to build unity and foster goodwill within a community. In just two months, countless community leaders, businesses, sponsors, and volunteers pulled together to organize a successful event. Based on feedback from attendees, The Longest Table accomplished its goals.